Tri-City Christian running back Anthony Madden rushed for 209 yards and scored five touchdowns in the Eagles’ season-opening triumph. TCC hosts Mountain Empire on Friday night in a nonleague game in Vista. VISTA  It was the last scrimmage before the start of the 2015 season for the Tri-City Christian High football team when first-year head coach Shane Goodwin found a diamond in the rough. That shiny rock turned out to be Anthony Madden, who wasn’t quite polished yet when Goodwin first laid eyes on him. “He was the JV running back as a junior,” Goodwin recalled. “We felt as coaches that he was not quite ready. It was at the point where it seemed like he really didn’t want to play. “But the following week our starting running back tells us five minutes before the game that he can’t go. It was the first game of the year and Anthony became our starting running back by default. After helping the Eagles win the Pacific League championship last season, Madden continued to show marked improvement in the 2016 season opener by having his most productive game offensively since he first donned pads. 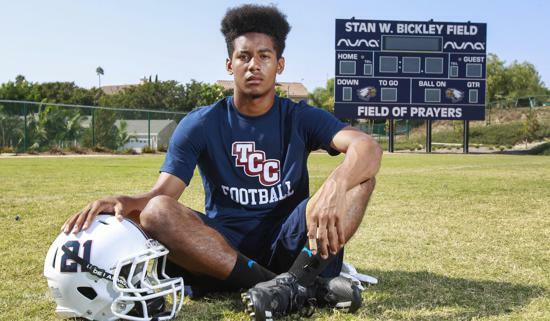 With Capistrano Valley Christian as the opponent at TCC’s Stan W. Bickley Field, Madden went off for 209 yards rushing while scoring five touchdowns as the Eagles romped to a 45-6 victory. Madden broke tackles throughout the night, but he proved to be exceptionally deceptive on one particular scoring run when he eluded two defenders behind the line of scrimmage, including a defensive lineman who seemingly had Madden wrapped up. “He was Houdini on that one,” Goodwin said. “I just didn’t want to be taken down,” said Madden, who stands a mere 5-feet-6 and tips the scales at a sturdy 145 pounds. It’s a solid frame that will be expected to carry a load for the Eagles this season as a defensive back and kick returner in addition to playing running back in a single-back system. “He was an all-league defensive back at corner last year,” Goodwin said. Impressive for a youngster who never played football while growing up in Fresno with his family — parents Anthony and Shamika Madden and three younger brothers. “I played soccer, but I never tried football until my freshman year here,” said Madden, a young senior at 16 who left family and Fresno behind and moved to Vista prior to the ninth grade. He has since been living with teammate Jace Mertes and his family. Madden says the camaraderie of his team has allowed him to enjoy the game even more. After a bye in Week 2 of the season, Tri-City Christian will host Mountain Empire in a nonleague game at 7 tonight. Madden remains confident the Eagles can make another run at a league championship this season.